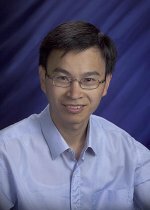 Congratulations to Pacific Northwest National Laboratory scientist Dr. Wei-Jun Qian for receiving an Early Career Research Award from the Department of Energy. He will develop a suite of quantitative proteomics technologies to gain understanding of the spatial and temporal regulation of cellular functions. Funding for this 5-year research grant is under the American Recovery and Reinvestment Act. Qian will receive $500,000 a year to cover year-round salary plus research expenses. In this project, called "Spatial and Temporal Proteomics for Characterizing Protein Dynamics and Post-Translational Modifications," PNNL researchers will demonstrate the effectiveness of the technology suite on environmental eukaryotes—organisms whose cells contain complex structures inside the membranes—such as Aspergillus niger, a fungus that plays an important role in biofuel production and global carbon cycling. Qian has been at PNNL since 2002. His research involves developing and applying novel mass spectrometry-based quantitative proteomics approaches for accurate and sensitive quantification of protein dynamics in cells, tissues, and biofluids. He is currently focusing on developing more sensitive targeted protein quantification based on selected reaction monitoring (SRM)—mass spectrometry to complement global proteomics discovery. His work has enabled broad applications in various biological systems, and a number of the developed technologies have been applied to study cell signaling and biomarker discovery involved in different diseases such as diabetes.